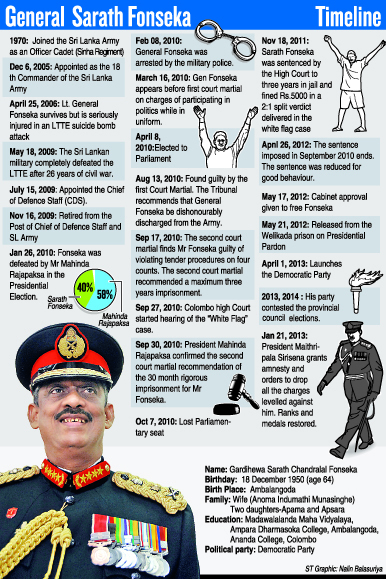 Former army chief Sarath Fonseka who was this week exonerated of all charges including treason by a presidential pardon declared that he would concentrate on a political career and sees no role with the military. Mr. Fonseka told the Sunday Times at his party office, in Kotte, that he would now prepare his party for the next parliamentary elections and plans to field candidates throughout the island. “We will definitely contest under our party. We need to get organised in the north and east,” he adds. Mr. Fonseka believes that they have a voter base of 800,000 and says their campaign will be for ‘clean democracy’ based on policies and principles to have a society free of corruption and free from dictatorial governance. “The people have a right to identify us and do justice to the right thing. The other parties also can change. We do not think that the other parties are following those principles. Some of the leading parties have not followed these principles. You get corrupt persons, some are criminals. Some are drug dealers. They also can change and ask for votes. The other small parties like the JHU and JVP have principles,” he said. The ex-army chief was receiving a stream of guests who had turned up to wish him after being restored with medals and ranks which he lost in August 2010. This was after being found guilty by a Court Martial in the case where he faced charges of being involved in politics while serving in the Army. 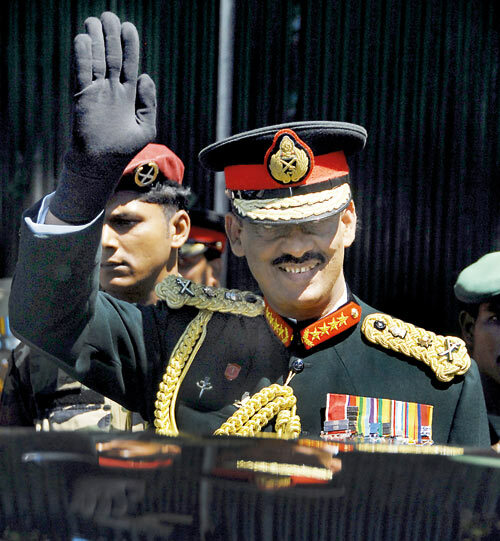 The Tribunal recommended that General Fonseka be dishonourably discharged from the Army. The possibility of Mr. Fonseka regaining his parliament seat is also under consideration. However Mr Jayantha Ketagoda who was appointed in his place needs to resign. Mr Ketagoda has offered to resign, but so far has not. “Now we are discussing with the Attorney General and Elections Commissioner. We are tyring to see if anything can be done regarding the seat. Otherwise I am not in a hurry. I can wait for four months and face fresh elections,” he said. He says the government is also discussing the possibility of naming General Fonseka as a Field Marshal. “They are looking into it. It has never happened in the country – they are looking into rules and regulations’, he added. However, he says he has no plans to play a role in the military. “I do not want to play a role on the military line. I have nothing to do in the military now. I have joined the democratic process as a politician. My only march forward will be on that line as a politician under the democratic concept,” he added. “The military will have to do their job. I will not get involved in the military deployment. But we will ensure that the military is doing their job. As politicians who are working with the ruling government we will ensure that they will do their job. At the same time we will give them their due respect and place,” he said. Reacting to the presidential pardon given this week, he said it was a ‘small thing’ compared to the January 8 victory at the Presidential election. “I am very happy about what happened in the country, so what happened to me is a very small thing, compared to what the country has achieved. Not only for me , everybody in the country is happy these days. You can see people relieved, they are smiling, they are at ease,” he said. “I am also a part of that group. What I have got is not everything; there are so many things which the country has lost. We have to get back so many things,” he said. “When I came out of the military, I challenged Rajapaksa single handedly. I had a target. I knew the path was going to be very difficult. He is very revengeful. I knew it was going to be dangerous; it was going to be tough. I was confident like I was confident in defeating terrorism. When I came out of jail in 2012 I told that I would send him home by 2015. I made a public statement. I have done it,” General Fonseka said. ‘I was confident, I knew we had to get rid of him to save the country. We couldn’t allow him to ruin the country . We are not ready to leave the country and hide somewhere saying that this country is not good enough for us to live. We wanted to chase him away. Now, this is a good place to live in,” he added. Mr. Fonseka says that LTTE’s chief arms procurer Kumaran Pathmanathan should be brought to justice while former Deputy Minister Vinyagamoorthy Muralithan alias Karuna should answer allegations against him. “KP will definitely have to face the law,” he adds. General Fonseka requests the public to keep confidence in them (government) in their fight against corruption. “There is no point in opening with a big bang and just ending it. We are trying to start this drive with a solid foundation. We will not give up. As long as we are there corrupt people will not be able to continue. There should be accountability for whatever they did. We will make sure that the Rajapaksa brothers will be held accountable for what they did. They will have to explain to the country. So do many others,” he concluded.